To all the Facebook fans, addicts and users. You might be fully aware that now you can have a user name instead of the ugly URL that passed your user id ?id=123456789, which is cool. I guess this may be another bid of Facebook be similar to Twitter. In the last design change many had complains that it was too much like twitter mainly the wall thing. Let’s hope everyone gets their desired username be it their own name, first name only, first and last name or a nick that identifies their web presence. 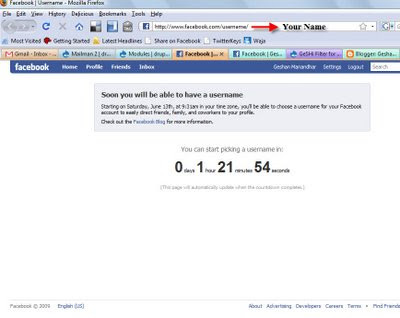 So hurry up and grab your facebook user name at http://www.facebook.com/username. Enjoy your desired faceboook username and don’t be left behind hurry up.